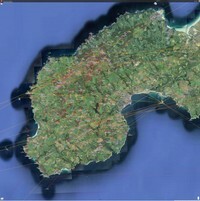 This is a map of the ancient sites and alignments in West Penwith and in neighbouring areas. You can see it in two formats: as a downloadable JPG image (7Mb) or on Google Maps. What does the map show? 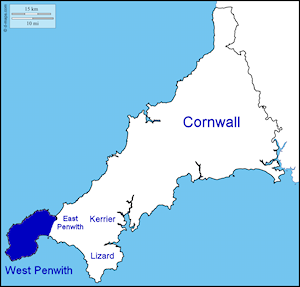 The map shows the known ancient sites of West Penwith, together with the alignments between them. These alignments demonstrate that ancient sites were very deliberately located, constituting an integrated system covering the peninsula. Map alignments were first identified by Alfred Watkins in the 1920s-30s and the idea was further developed by John Michell in the 1960s-70s. They are not energy-lines or energy-leys: they are simply sites that are aligned with each other. All alignments shown on this map are accurate to within three metres, with a few exceptions at five metres. Alignments have a minimum of four sites on them - mostly more - though there are three-site exceptions (discussed on another page). Alignments have been drawn from a list compiled by Ray Cox of Meyn Mamvro, using research done over several decades by John Michell and contributors to Meyn Mamvro. Many new alignments were also discovered during the making of the map and added to the list. All alignments have all been carefully checked by the mapmaker, Palden Jenkins, and by Cheryl Straffon and Ray Cox (click to see who we are). The map will be updated as new information and ideas come in. Google Maps was chosen over other alternatives because of its accuracy, editability, public availability and its zero costs. Sites were entered on the map, using precise locational data sourced from Pastscape, The Megalithic Portal, The Modern Antiquarian, and also from books, the journal Meyn Mamvro, Ray Cox's list, personal contacts and field research. Ray Cox's list of alignments was then entered on the map. In the process, 20% of alignments in the list were scrapped, since they were found to be insufficiently accurate. New alignments emerged and, once checked by Ray and Cheryl, they were entered on the map. These more than doubled Penwith's known alignments. These alignments are regularly reviewed. Quite a few sites marked on the map are no longer present - they have been destroyed or moved, mainly by farmers, landowners and miners. Their locations have been identified by studying historical records, field evidence and other sources, and through archaeological and dowsing work by a variety of researchers. Many now-destroyed sites were mentioned by an antiquarian of the late 1800s called William Borlase, and by others. Some were removed as recently as the 1970s-80s. Even today, battles continue over mobile phone masts, cattle damage and questionable conservation measures. 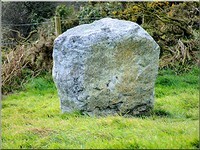 Establishing alignments through distinct points such as menhirs, stones, crosses and quoits is straightforward. In the case of stone circles, enclosures, rounds and some barrows and cairns, alignments sometimes tangent their perimeter rather than cutting through the centre of the site. One early discovery was that of a direct alignment of three hills - St Michael's Mount, Trencrom Hill and St Ives Head - which, perceptually, form West Penwith's eastern boundary. (On the A30 you cross it in the village of Crowlas, between Hayle and Penzance.) Many other discoveries evolved from there. These are outlined in the More on the Map and Findings sections of this site. Some are 'backbone alignments' - longer-distance alignments linking higher-magnitude sites, giving the overall alignment system an overall structure. 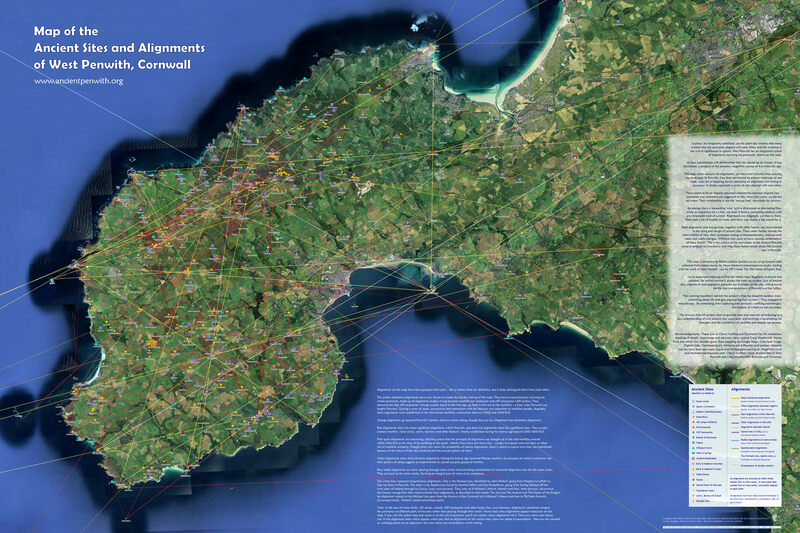 Most other alignments are local to West Penwith - on the map these have been grouped into major and lesser alignments. These differing alignments are marked in different colours (see map key). This classification is neither final nor conclusive - it's a working hypothesis and a way of making sense of a profusion of alignments. The finding of new alignments was partly a logical process and partly intuitive. It's logical to look for alignments radiating from certain major sites such as St Michael's Mount, Boscawen-ûn or Lanyon Quoit. Intuitively, alignments also revealed themselves spontaneously, often 'by chance' while working on the map. There isn't a neatly rational system or pattern to these alignments, to our modern way of thinking, such as grids or geometrical shapes, yet there is still a coherence to it all, with hints of both an organically-arising and a thought-through, planned order. The idea came in 2013 to Palden Jenkins, who has been interested in geomancy since 1971, when he rather innocently slept inside a stone circle, the Ring of Brogar in the Orkneys, and experienced a powerful, life-changing dream there which drew him into the subject. This started a process that unfolded over the decades, starting with field research in North Wales and then in Uppland, Sweden, through the 1970s. Later, when resident in Glastonbury between 1980 and 2008, he researched and published the Map of the Ancient Landscape around Glastonbury. This was a complex and meticulous project, and he prevaricated before starting work on a map of Penwith. The process started when he asked Cheryl Straffon, a mainstay of the Penwith archaeological scene, whether a map of the area's ancient sites was available. It wasn't. But it felt like there needed to be one, so Palden volunteered to do it. Little was he to know at that time the new discoveries that were to unfold as he compiled the map. There was much deliberation over the format to be used. Google Maps was chosen because of its public accessibility, editability, aerial-photographic basis and cost-free facility. The Penwith map was started in December 2014 and work went on through the subsequent stormy winter until it was completed by June 2015. While doing this it became evident that more research needed to be done in future, especially on astronomical alignments, dowsable energy-lines, site intervisibility and other issues. The work will continue and develop further in coming years, and progress in this work will be reported on this site. Google Maps, DigitalGlobe, Getmapping plc, Infoterra Ltd, Bluesky, Landsat and Terrametrics for the digital mapping and satellite photography that forms the base of the map. Two routes follow from here.